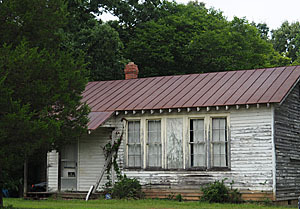 The earliest African-American school in the Esmont community was Glendower School, built in 1869 by the Freedman's Bureau on property donated by Mrs. Gordon Merrick on the Glendower Estate. In the early 1900's, the Loving Charity Lodge was a private school for black children in an Esmont building now known as the Sons of Esmont Lodge. Other schools for black children in the Esmont community included Esmont Colored School on Porter's Lane (1874), Chestnut Grove School (1930's), Sand Road School (1930), Benjamin F. Yancey Elementary School (1960), and Oak Ridge School in Schuyler. Early schools for white children included the old Esmont School, located on Esmont Road near the Esmont post office and train depot. Some of the local white children travelled and attended school in nearby Scottsville, which opened the first public school in Albemarle County in 1878. Both black and white children walked to school in the Esmont area for many years before public transportation was made available. In 1949, the Charlottesville School Board combined Jefferson High School, Esmont High School, and Albemarle Training School in Albemarle County, black schools in Charlottesville and Albemarle County, into a single school for all the black students in grades 8-12 in the area. 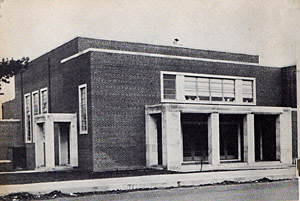 Construction of the Jackson P. Burley School was completed in 1951, and it was a segregated school for African-Americans in grades 8-12 in the area until 1967. Comments: The earliest African-American school in the Esmont community was Glendower School, built in 1869 at Gordon Merrick's Glendower estate property. The original Glendower School was a one-and-a-half story building built in 1869 during Reconstruction by the Freedman's Bureau. 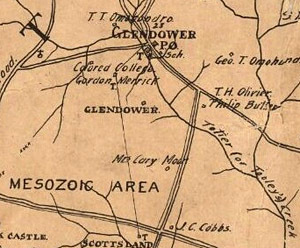 The 1907 map of Albemarle County, Virginia, by Frank A. Massie, shows a 'Colored College' adjacent to Gordon Merrick's property in Glendower. Comments: The Loving Charity Lodge of Esmont, VA, was a private school for black children in grades one through six. The 1909 student body is shown with their teacher, Miss Rebecca Moore. 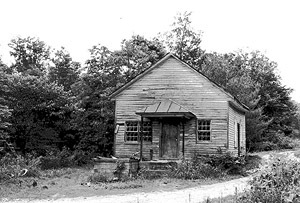 The Loving Charity school- house was located in the building now known as the Sons of Esmont Lodge at 7302 Porters Road, Esmont, Va. Comments: The Chestnut Grove School building sits next to the Chestnut Grove Baptist Church. The school building was built in the 1930's, and it had one room. This 1930's schoolhouse for African-American students replaced a previous building at this location, 8819 Chestnut Grove Road in Esmont, VA. According to Chestnut Grove Baptist Church's commemorative history, the new school building cost $2,200. Agnes Rush states in her 2002 interview for the University of Virginia's Race and Place project that "some people named Mr. Thacker" built it. Comments: The Oak Ridge School sits next to the Oak Ridge Baptist Church at 7734 Old Dominion Rd. in Schuyler, VA. Windows on the side of the schoolhouse face the church. Although the school appears in two 1930's-era Albemarle County school brochures, the names of teachers were not listed. Comments: Esmont High School is located at 7474 Esmont Road in Esmont and is a short distance north of St. Stephen's Episcopal Church on that road. Esmont High School was built in 1922 as the area's white school. Comments: The original Mount Alto school was a one-room schoolhouse, which was built by and for African Americans in 1890 for $700. 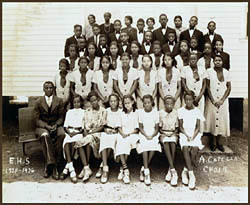 Nineteen students attend the school when it was completed. Around 1920, this Mount Alto school building was built possibly using materials taken from the original schoolhouse. This school was sited immediately adjacent to Mt. Alto Road at 4223 Mt. Alto Rd and was in operation teaching African Americans at least through the 1930's. Comments: The Esmont Colored School was built in 1916 for $4000 and contained 6 rooms. This was the fourth school for African Americans built in Esmont with the first colored school being built in September 1874. 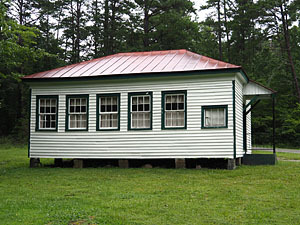 Its first teacher was a white man named John Lane who donated an additional acre of land to the school on which was built a one-room log cabin by the colored people living in Esmont. Since there was no playground and the second school building was built in the woods, the children had to play in the woods. 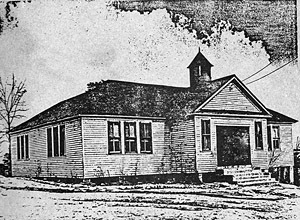 In 1893, the School Board built a third school building which was a two-room affair, one room built over the other one. By 1912, the men and women of Esmont had formed a School League, led by Benjamin F. Yancey, and worked together to acquire and donate three acres of land upon which the Esmont School Board placed the above 6-room building in 1916. This fourth school was located at 7625 Porters Road in Esmont, and it became Esmont High School for African-Americans by the mid 1930's. Comments: This Esmont High School a cappella choir, under the direction of Mr. Harry Washington, participated in a choir competition held in Petersburg, Virginia. See the larger image for names of the students, teachers, and parents attending this Petersburg music event. 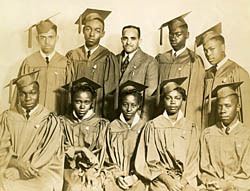 Comments: The graduating Senior Class of Esmont High School in 1942 is shown with their Principal Henry L. Summerall. See the larger image for names of the students of Esmont's Class of 1942. Comments: The graduating Senior Class of Esmont High School in 1943 is shown with their Principal Isaac D. Faulkner. See the larger image for names of the students of Esmont's Class of 1943. Comments: Benjamin F. Yancey Elementary School was founded in 1960 and named after the teacher, who came into Albemarle County in the late 1800's to create a school for African Americans. In 1961, Albemarle County completed a fine brick structure at 7625 Porters Road in Esmont on the 7 acres of Esmont Colored School property which had been procured by Esmont's black community. 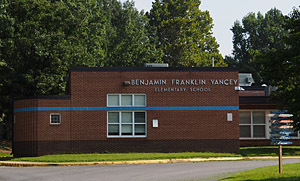 B.F. Yancey School housed kindergarten through fifth grade students, with sixth-eighth grade students attending Walton Middle School. In 1964, B.F. Yancey was integrated based on the Civil Rights Act, and the school slowly grew and adapted to a new diverse student body. After 56 years, B.F. Yancey School was closed in June 2017, and Albemarle County sent its students to Red Hill Elementary School and Scottsville Elementary School. Comments: In 1949, the Charlottesville School Board consolidated Jefferson High School, Esmont High School, and the Albemarle Training School into a single high school for all of the black students in Esmont and Albemarle County. 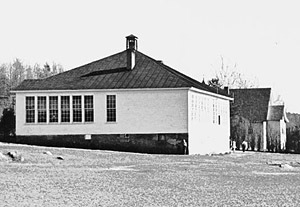 A new school building, shown at left, was completed in 1951, and the Jackson P. Burley School opened that year for classes on Rose Hill Drive in Charlottesville with a total of 542 African-American students in grades 8-12. Jackson P. Burley served as a segregated high school from 1951-1967.